Delhi weekend cultural calendar: Upcycling workshop, Bollyjazz gig, and more. 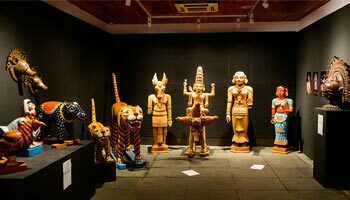 ART Serendipity Arts Festival 16 in 17 at Bikaner House A selection of the art projects that were displayed at the Serendipity Arts Festival in Goa in 2016 will be exhibited at Bikaner House. They include Indian Crafts: Tradition and Expression, a show of traditional crafts; Express/Aspire, a series of images by Delhi-based photographer Samar Jodha; and Chakraview, an installation on the idea of modern India by set designer Sumant Jayakrishnan, design strategist and one-half of audio-visual duo BLOT! The installation Chakraview is designed to resemble a spiritual journey. Walking through it is meant to evoke the sense of searching for utopia. It is personal, with just your reflection on the mirrored floors for company. 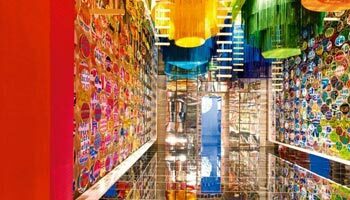 As you move from one chakra (wheel) to another, you wade through a cacophony of sounds, languages, colours and textiles to step into the inner sanctum. 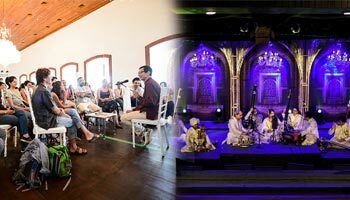 After successfully curating the Serendipity Festival in Goa, the Serendipity Arts Trust organised its first edition in the national capital. 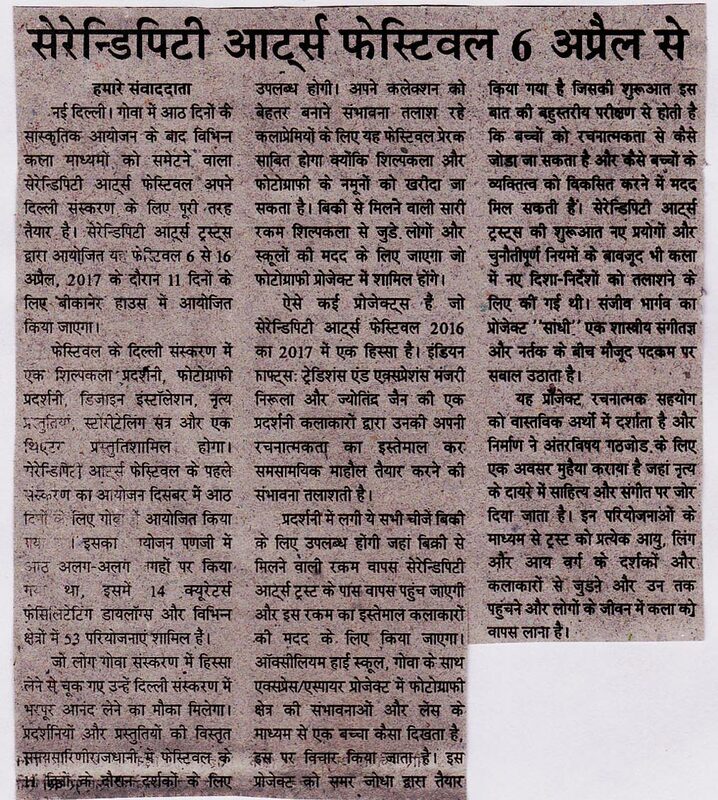 The essence of the festival is to bring traditional art forms to the modern-day audience. 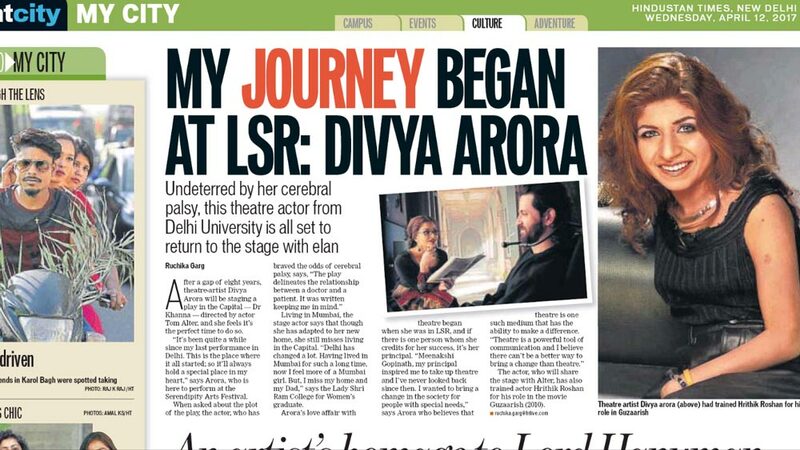 In line with this, in an informal atmosphere, Amrita Lahiri performed Kuchipudi on the first day of the festival. 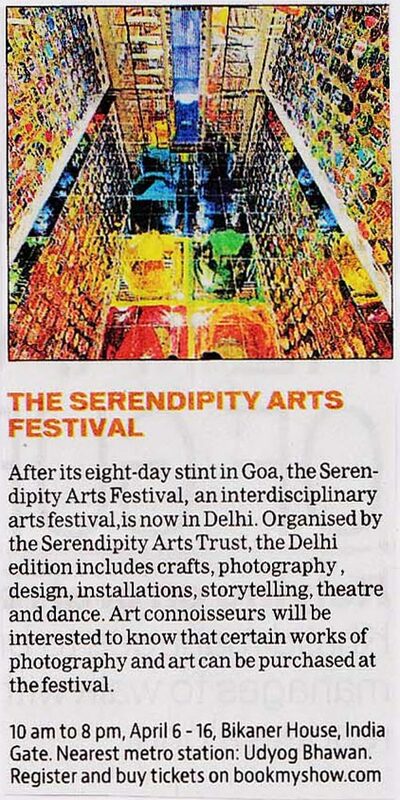 If you missed the Serendipity Arts Festival in Goa, you can catch it soon in Delhi. 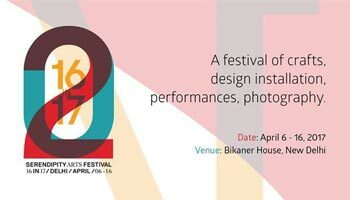 The interdisciplinary arts festival includes crafts and photography exhibitions a design installation, dance performances,storytelling session and a theatre performance. 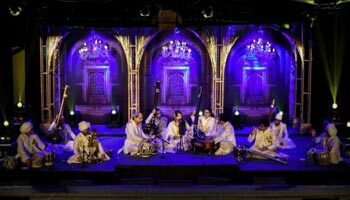 After eight days of cultural extravaganza in Goa, Serendipity Arts Festival, an interdisciplinary arts festival, is all set for its Delhi edition. 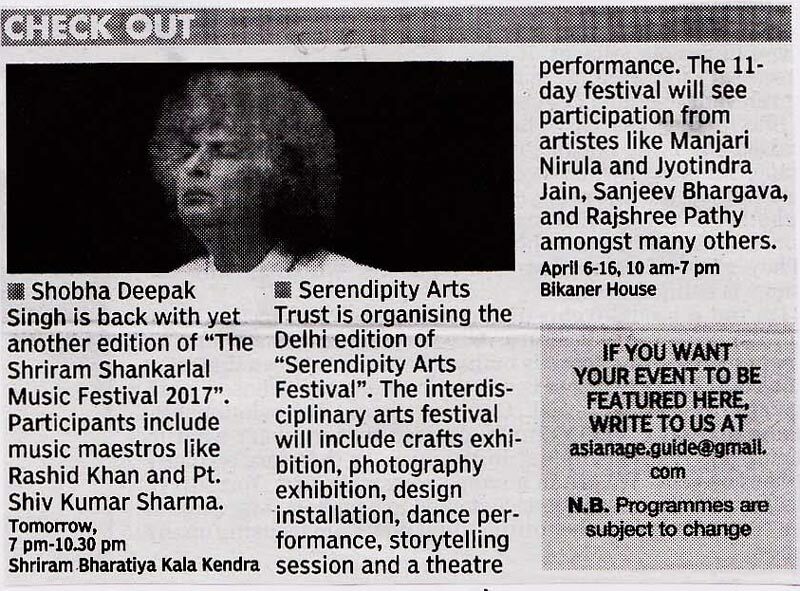 Organised by the Serendipity Arts Trust, Serendipity Arts Festival – 16 in 17, Delhi, will be held at Bikaner House for 11 days, from April 6 to 16, 2017.